London was an extraordinarily vibrant musical city at the end of the 18th-century. The musical impresario Johann Peter Salomon made his first public appearance in Covent Garden in 1781 and set about serving as the musical link between London and the German-speaking lands. In 1790 he persuaded Joseph Haydn to visit Britain, but the credit for introducing Haydn to British audiences goes to the violin maker William Forster with the assistance of General Charles Jerningham, British Ambassador to the Viennese Court. Back in 1781 Forster had bought the rights to publish Haydn’s Symphony no. 74. A warm business relationship blossomed and Forster brought more than a hundred works by Haydn to the British public. Forster was already moving fast in London’s musical circles, and his efforts were rewarded in the 1780s with the patronage of the Prince of Wales and his brother, the Duke of Cumberland. The Reverend Humphrey Aram Hole (1763–1814) was a dream customer for Forster. He was chaplain to the Prince of Wales and son-in-law to the Bishop of Norwich. Much is written on him in Sandys & Forster’s “History of the Violin”, including a gruesome account of the amputation of one of his fingers, and according to his obituary: “In Musick he eminently excelled; and was allowed (notwithstanding the loss of the first finger of his left hand) to be the first [i.e. the finest] amateur player on the violoncello in the kingdom”. Hole was not only influential among Forster’s client base, but an enthusiastic customer. In 1789 he bought his first Forster cello direct from the maker, and after Cervetto bought the first of Forster’s Stainer copies later that year, he promptly put in an order for one of his own. Afterwards he bought three more cellos in 1796, 1803 and 1806. By the middle of the 1780s Forster claimed to make copies of “every Capital Instrument in England”, although in reality the vast majority of his instruments were based on an Amati model. Forster had resisted following the generic English Stainer models in order to differentiate himself in the market, and when he was eventually forced to make instruments of this model in order to validate his claim, he consciously kept away from an English tradition. Genuine cellos by Jacob Stainer are rare, and there is some doubt whether one was available for Forster to copy, but the few Stainer-model cellos he produced are much more in keeping with Stainer and his German contemporaries than those of the English tradition. Forster’s account books record that his first Stainer copy was made in 1789, for James Cervetto, one of the great cellists of the day. By the time Forster began making Stainer copies, the 18th-century London tradition was on its way out. 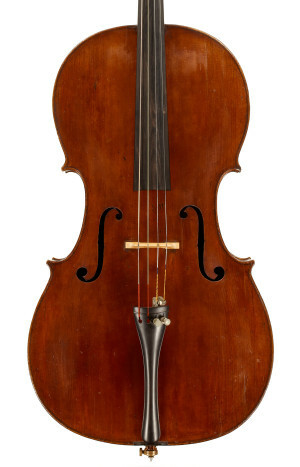 Forster himself preferred Amati models; Vincenzo Panormo was beginning to influence makers gravitating around the Betts workshop; and John Dodd was taking his influence from Cremonese models. These rare examples of a Stainer model made by Forster really fit outside the English 18th-century tradition exemplified by Peter Wamsley or Thomas Smith. They were instruments intended as copies of the “Capital Instruments in England”, and were chosen by some of the leading cellists of the day.